What is the White Paper on International Migration? Keep up to date with our Teach-Yourself Series – condensed articles on current and planned changes in South African migration law. 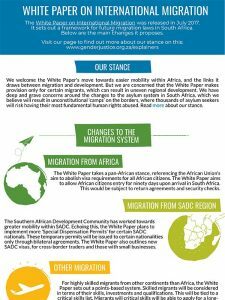 Our articles and infographics aim to spread awareness on South Africa’s migration landscape, and our standpoints on the issue. This is a joint initiative between The Scalabrini Centre of Cape Town and Sonke Gender Justice. The first four topics in this series are: the Refugee Amendment Act, the White Paper on International Migration, birth registration and health care access. For further information about the issues discussed in the series, contact lotte@scalabrini.org.za or you can visit www.genderjustice.org.za. The White Paper on International Migration was released in July 2017. This Paper sets out the framework for future immigration law in South Africa. Prior to a White Paper, a Green Paper is released, for which we wrote submissions. Green and White Papers form part of the process of law-making in South Africa. The White Paper acknowledges that migration can help South Africa reach its National Development Plan goals, but it also links migration strongly to security risks, trafficking and corruption. In our submissions, we warn that an over-emphasis on the criminality of migration misrepresents most migrants living in South Africa, and reinforces the ever-growing securitization of migration.